van der Aa, H.; Carmona, J.; Leopold, H.; Mendling, J.; Padro, L.
The Business Process Management (BPM) field focuses in the coordination of labor so that organizational processes are smoothly executed in a way that products and services are properly delivered. At the same time, NLP has reached a maturity level that enables its widespread application in many contexts, thanks to publicly available frameworks. In this position paper, we show how NLP has potential in raising the benefits of BPM practices at different levels. Instead of being exhaustive, we show selected key challenges were a successful application of NLP techniques would facilitate the automation of particular tasks that nowadays require a significant effort to accomplish. Finally, we report on applications that consider both the process perspective and its enhancement through NLP. 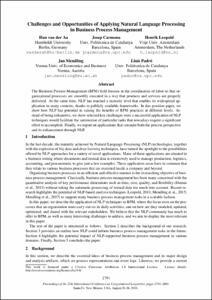 van der Aa, H., Carmona, J., Leopold, H., Mendling, J., Padró, L. Challenges and opportunities of applying natural language processing in business process management. A: International Conference on Computational Linguistics. "COLING 2018: The 27th International Conference on Computational Linguistics: Proceedings of the Conference: August 20-26, 2018 Santa Fe, New Mexico, USA". Stroudsburg, PA: Association for Computational Linguistics, 2018, p. 2791-2801.